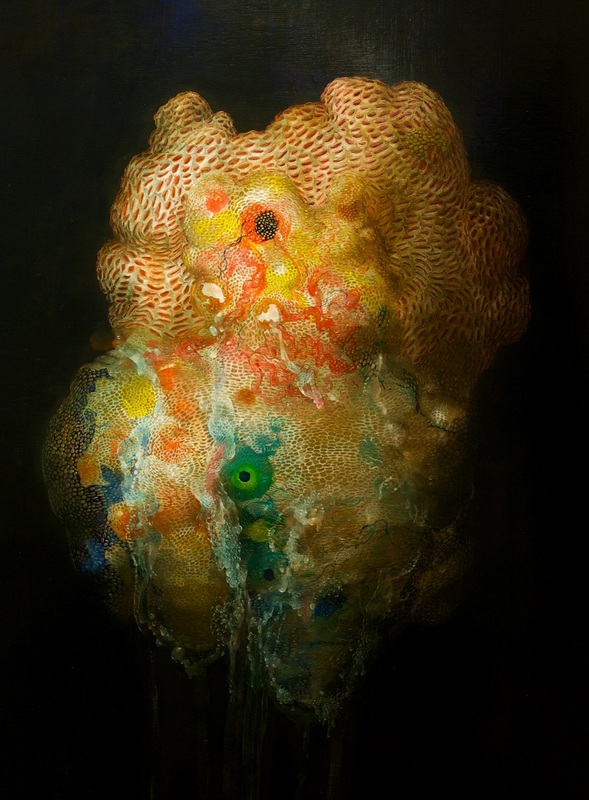 Natural phenomenon – dermoid cysts, fungus, invasive flora/fauna – and my love of candied, old-master, opulence have a constant presence in my work. Through painting with attention to detail, I’ve become accustomed to the fact that nature itself, or anything living really, never totally allows you to have a perfectly idealized experience. Everything is always spewing, dripping, rotting a little. 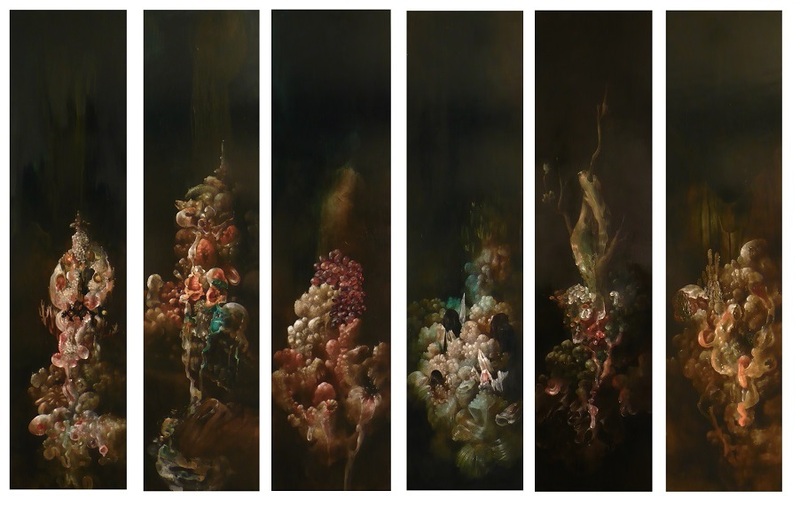 Similar to 17th century still-life paintings with those vibrant lusty fruits that show the light fuzz of beginning decay, I don’t see these works as allegorical depictions. To me it is more the realization that both the rot and the fruit are a textural attraction in their delicacy; both take the same concentration and care to paint. Nicole Duennebier has been making her way through New England for around a decade with stints in Connecticut, Maine, and now Massachusetts. Along the way she found herself on Monhegan Island, where she first made an equation between 16th Century Dutch painting and the darkness that can surround ocean life. Take the opportunity to check out Nicole’s work in person at 13Forest through March 14th. 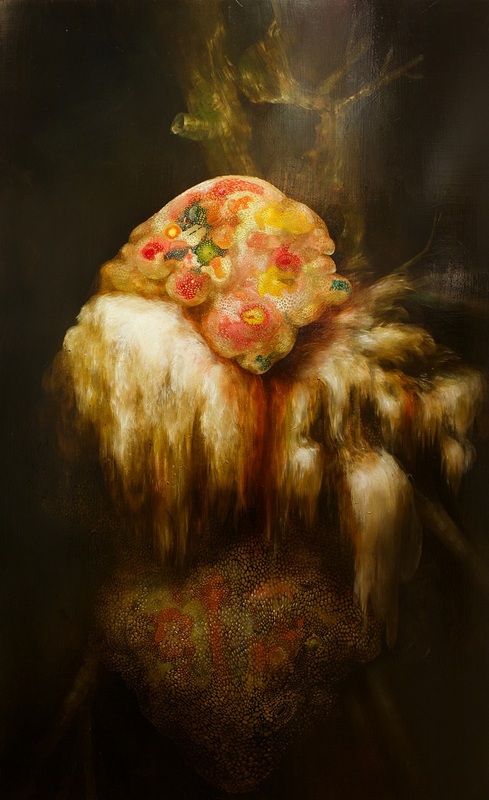 Tags: 13forest, dermoid cysts, fungus, invasive flora/fauna, Nicole Duennebier, painting, still life. Bookmark the permalink.